The system TTP 8302.T is equipped with optical sensors and has an application specific operators' frontend which provides all necessary data regarding the organisation of the extrusion process of treads and side walls. The TCP 8302.T is based on laser triangulation sensors and therefore ensures the measurement being independently from material constants. In order to ensure highest precision, the laser beams of the sensors are accurately adjusted during the production process using optoelectronic tools which have been specially developed. 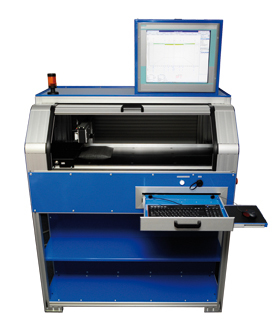 Offering an easy operation, the system provides an in-situ calibration unit and ensures high precision.